My mom died in 1995, after a long and withering battle with colon cancer. She died in bed at home. As an adult, I had a great relationship with both of my parents. I could go to them separately about different matters. Mom was the practical one, the problem solver who cut through the distractions and pushed me in the right way. 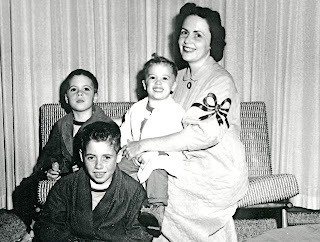 Raising five sons (brothers Pat and Chris not yet born when this photo was taken) certainly was not her first choice in life. In another era, she would have been a prominent figure in business and law. Trained as an R.N. at Seattle University, she and my dad both applied to law school at Gonzaga but didn't go because she got in but he did not. As a mom, and one of five female siblings, with each pregnancy she badly wanted a daughter. Much, much later, I asked her how she felt that in 1955 again no daughter had emerged but instead a son -- me, her first red head. "Oh, I cried," she said. Once I ran away, of a sorts, by taking the bus to the University District to observe the sidewalk hippies. She somehow found me and when I got into the car, I saw she had been in tears. I mattered to her, and I felt guilty that I had caused her suffering. In an odd sense, it was the first time I ever saw her as not just my mom but a person of real feelings whom I loved. The greatest gift any parent can give is unconditional love and to this day there are issues I wish could share with her. During her illness in 1995, I was working on a book so I had the schedule flexibility to visit her every day in the hospital. Watching this strong woman grow weaker was the most painful thing of my life, matched only by seeing the same thing happen to my father 10 years later. Her death gained notice in The Seattle Times and was marked by one of those classic big Irish Catholic family masses: a crowd of priests, a packed church, and a wake at our house where one friend, an immigrant from Ireland got so drunk he began to sob which somehow caused his nose to bleed, dribbling red on a brother's white dress shirt. At first, I felt embarrassed, then amused: Tot would have liked a gathering that included all the elements of the Irish wake, especially the drunken episode that had really bothered no one. After her death, a lot of people spoke to me about how much they admired her. She powered a lot of personal and group organizations. She pushed my dad to a professional level where he accomplished significant things for our city. One of her friends told me how much she missed her and how much she had loved her. "She was such a tiny person," the friend said. Tiny? I thought. I never though of her as short, though she was probably 5'2". So she was tiny, but she always felt big in my life. I miss her terribly.